This chapter describes how application features with content from remote URLs can access (or be restricted from) device services. Section 12.1, "Overview of Remote URL Applications"
Section 12.2, "Overview of Enabling Remote URL Implementations to Access Apache Cordova"
Section 12.3, "Enabling Remote Application to Access Device Services through Whitelists." Section 12.4, "Creating Whitelists for Application Components." Section 12.5, "Enabling the Browser Navigation Bar on Remote URL Pages"
By configuring the content type for an application feature in the overview editor for the adfmf-feature.xml file as Remote URL as described in Section 5.10.1, "How to Define the Application Content," you create a browser-based application that is served from the configured URL. Such server-hosted applications differ from applications written in ADF Mobile AMX or a platform-specific language such as Objective-C in two ways: they are intended for occasional use and cannot access the device memory or services directly, as these interactions are contingent upon the capabilities of the device browser. Browser-based applications targeted for smartphones may be authored using Apache Trinidad components (described at http://myfaces.apache.org/trinidad/) to enable proper rendering of display components on a variety of feature phones and smartphones. An application that runs on a tablet can be created in the same manner as an ADF desktop web application. 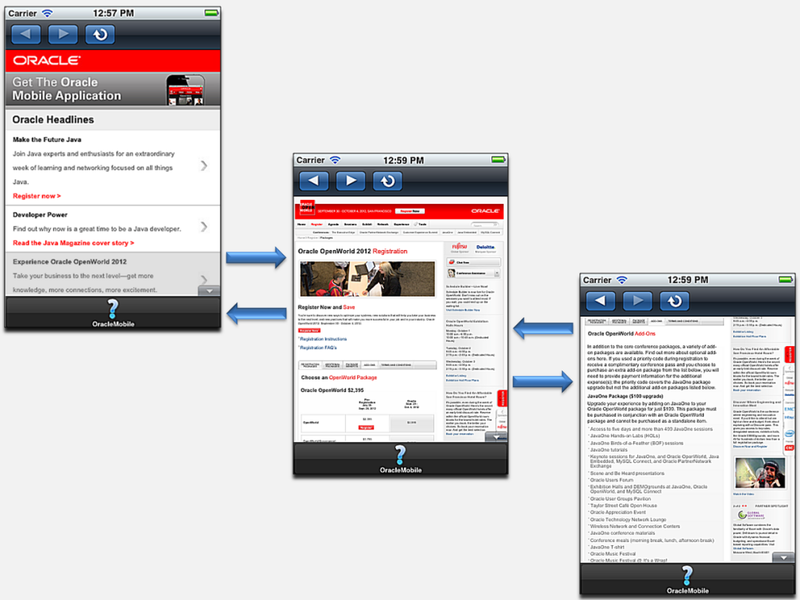 Oracle recommends using ADF Mobile browser for application features that derive their content from remote URLs. ADF Mobile browser applications are comprised of JSF pages populated with Apache Trinidad components. For more information, see Oracle Fusion Middleware Mobile Browser Developer's Guide for Oracle Application Development Framework. ADF Mobile supports the concept of whitelists, a registry of URLs that open within the application web view and can access various device services, such as GPS, a camera, or a file system. If a web page is not included on a whitelist (that is, it is not whitelisted), then ADF Mobile's Apache Cordova implementation opens a web page in the device browser (such as Safari) instead. Without whitelisting, a remote web page cannot open within a web view. By default, the domains defined in the connections.xml file, the repository for all of the connections defined in the ADF Mobile application, are whitelisted automatically. These connections are defined using the Create URL Connection dialog, shown in Figure 12-4. ADF Mobile parses the domain from each of the connection strings and adds these domains to the whitelist. 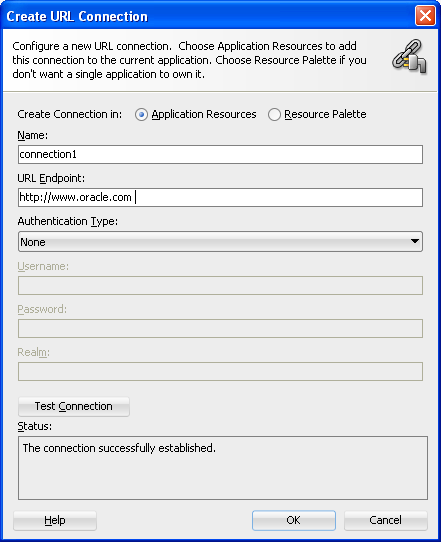 JDeveloper then populates the connections.xml file, located in the Application Resources panel, with the connections information and also creates the connection resources, such as oracle and connection 1 in Figure 12-2. Only whitelisted domains open in the web view; all other (non-whitelisted) domains open in the device browser. By editing the adfmf-application.xml file, shown in Figure 12-2, you can restrict access to the Apache Cordova-enabled device services on a per-application feature basis. By default, all application features have such access, meaning that any whitelisted domain configured for the ADF Mobile application can also access the device. In addition to the domains that ADF Mobile includes from the connections.xml file, you can also whitelist domains using the Security page of the adfmf-application.xml file, as described in Section 12.3.2, "How to Create a Whitelist." The Source editor illustrated in Figure 12-2 shows the <adfmf-feature-reference> element populated with the allowDeviceAccess attribute. JDeveloper populates all application features with remote URL content with this attribute, which by default, is set to true. This default setting signifies that all URLs can access the Apache Cordova APIs. 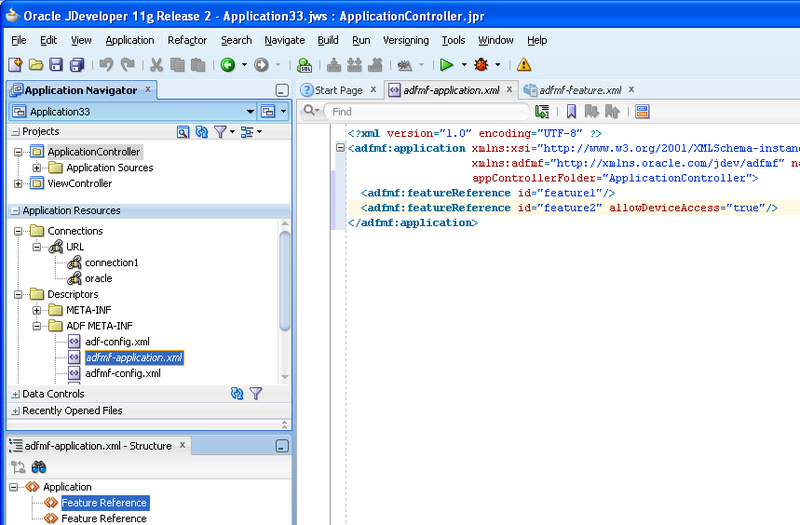 Using the overview editor for the adfmf-feature.xml file (located in the Application Navigator in the Project panel under the View Controller and META-INF nodes), you must designate the content for an application as Remote URL and then create the connection as described in Section 5.6.1, "How to Designate the Content for a Mobile Application." Open the overview editor for the adfmf-application.xml file by double-clicking the adfmf-application.xml file (located Application Resources panel under the Resources and ADF META-INF nodes, as shown in Figure 12-2). You can use the Source editor, Structure Window, and the Properties editor to configure this attribute. Open the adfmf-application.xml file and then open the Feature References page. Using the dropdown menu from the Allow Device Access column of the Feature References table, change the default value (<default> true) to false, as shown in Figure 12-3. You configure the whitelist in the Security page of adfmf-application.xml, shown in Figure 12-4. Be aware that some URLs configured in the ADF Mobile application may open to other domains. Open the adfmf-application.xml file and then select the Security page. Click Add and then enter the domains that can be called from within the web view of the application feature. These domains can include a wildcard (*). For example, *.example.com is a valid domain entry as is *.example.*. You cannot enter a fully qualified path. Entering only the wildcard allows the web view to request all domains and can pose a security risk; adding all domains to the whitelist not only enables all of them to open within the web view, but also enables all of them to access the device (whether or not it is intended for them to do so). When you add a domain, JDeveloper updates <adfmf:remoteURLWhiteList> element as illustrated in Example 12-1. Some URLs are redirected to a URL that may not be part of the whitelist domain. These URLs may open in the device browser rather than the application web view. For example, if you whitelist www.oracle.com (<adfmf:domain>www.oracle.com<adfmf:domain>) and open that site on the device, ADF Mobile redirects to the mobile version of this site (www.oracle.mobi), because it does not pass the whitelist. Figure 12-5 shows a web page that has not been whitelisted and has opened within the device browser. 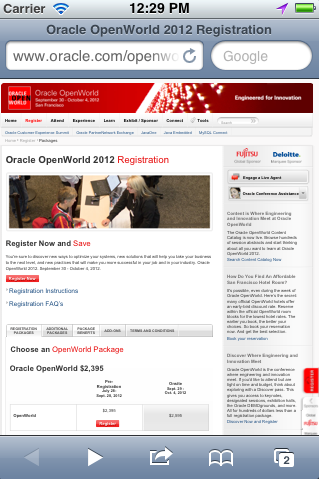 To enable www.oracle.com to open within the application web view, you must specify *.oracle. 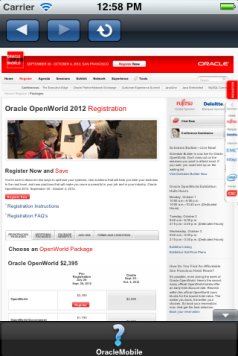 * or www.oracle. * as shown in Example 12-1. Because ADF Mobile whitelist is at the domain-level, you cannot restrict an individual page within a whitelisted domain from opening with an application feature web view; all pages are allowed. Use a whitelist for pages that contain links to URLs that point to another domain. Such pages would otherwise open in the device browser instead of the ADF Mobile web view. In such a case, you can create an anchor tag or an <amx:goLink> component with a url attribute for the <amx:goLink> component that points outside of the application, such as the url attribute in <goLink2> in Example 12-2. <amx:goLink text="This opens in the device browser"
<amx:goLink text="This opens in the web view"
See also Section 7.3, "Creating and Using UI Components." ADF Mobile enables you to add a navigation bar with buttons for back, forward, and refresh actions for application features implemented as remotely served web content that open within the ADF Mobile web view, as shown in Figure 12-6. The forward and back buttons are disabled when either navigation forward or back is not possible. The back button is disabled on Android-powered devices. You enable users to navigate through, or refresh remote content through the Content tab of the overview editor for the adfmf-feature.xml file. Designate an application feature's content be delivered from a remotely hosted application by first selecting Remote URL and then by creating the connection to the host server, as described in Section 5.10, "Defining the Content Types for an Application Feature." Ensure that the domain is whitelisted. Select the Remote URL application feature listed in the Features table in the adfmf-feature.xml file. Select Show Browser Navigation Buttons, as shown in Figure 12-7. JDeveloper updates the adfmf:remoteURL element with an attribute called showNavButtons, which is set to true, as shown in Example 12-3. 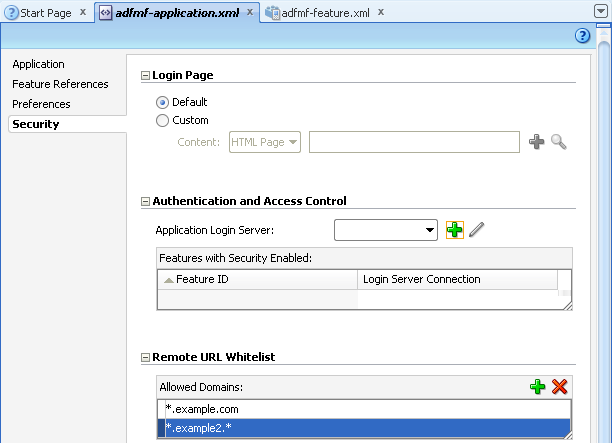 After you deploy the application, ADF Mobile applies the forward, back, and refresh buttons to the web pages that are traversed from the home page of the Remote URL application feature, as shown in Figure 12-8.